When? 1997 | What’s is rated? PG-13 | Where’s it available? DVD. Sounds awful, right? Indeed, Beverly Hills Ninja was a very bad movie, torn apart upon its release by nearly every critic. But—I just can’t stop laughing every time I watch it, which is quite a few times. 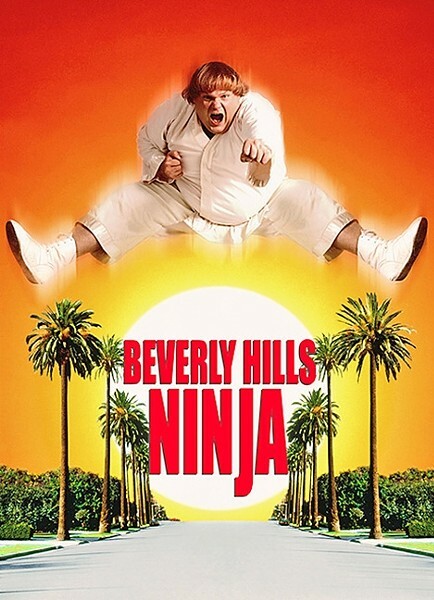 Beverly Hills Ninja was Farley’s last film before his premature death; it co-starred Chris Rock, and it puts Farley’s unparalleled prowess for physical comedy on full blast, like a super-sized dollop of his genius to enjoy before he passed away. Farley plays Haru, who, as an abandoned baby, was adopted by a clan of ninjas after washing up on the shores of Japan. The ninjas believe Haru to be “the great white ninja” stipulated by ancient legend. They raise him with great expectations about his potential, but are deeply disappointed when Haru struggles to adapt to ninja culture and fails in his training at every turn. Grown up and totally incompetent, Haru finds himself in a pickle when, alone at the temple, he’s paid a visit by an American woman, Alison Page (Nicollette Sheridan). She’s seeking ninja assistance on a dangerous situation involving her boyfriend counterfeiting currency in Beverly Hills. A deer in headlights, Haru tries to fake it until he makes it as a ninja and decides to travel to California to help Alison. Secretly, one of Haru’s ninja brothers, Gobei (Robin Shou), follows him to Beverly Hills, knowing that Haru can’t fend for himself amid danger. It’s at a Beverly Hills hotel where we meet a bellboy, Joey Washington (Rock), and Alison’s counterfeiting boyfriend, Martin Tanley (Nathaniel Parker). Hilarity ensues as Haru attempts to pass as a ninja superhero and crack the case, with Gobei basically saving him (under the radar) from every failure along the way.